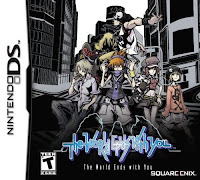 The World Ends with You is the sort of game youâd expect to see at the end of a consoleâs life cycle.Much like the original Paper Mario or God of War II, the developer obviously knew all of the nuances of the hardware, and how to get the most out of them.Free from the constrictions of an existing franchise, Square Enix and Jupiter have cut loose and crafted a unique and engaging experience that challenges both your combat and fashion sense. With TWEWY I definitely came for the extensive customization, but I ended up staying for the co-op play, if you can believe it.Being the turn-based strategy game junkie that I am, I have a deep-seated love for endlessly tweaking and adjusting my cast of characters between every encounter (my FF: Tactics game can attest to that).And while this isnât a turn-based game, TWEWY delivers that customizable fix that Iâve come to enjoy so much.From the clothes on your back, to the food in your stomach, to the pins on your chest, everything here affects your characters either numerically, changes their move set, or gives them a special ability. However, all of these fine details donât amount to much if you canât put them to good use.Luckily, the combat mechanics here will keep you engaged throughout by utilizing both the top and bottom screens of the DS.Up top youâll be using the d-pad, or face buttons, to line up symbols in order to score hits on your opponent.On the bottom itâs the various motions of the stylus that dictate what actions you perform.Sure they both sound simple enough when theyâre separate, but try controlling both at the same time and pretty soon youâll find yourself setting up that auto-play feature. Now, if youâre like me and canât manage what feels like doing ten things at once, you could always play the game co-op.No, I donât mean wireless co-op, I mean you and your partner sit side-by-side and each controls either the top or bottom screen.Sure there might be some arguments about skipping through dialog too quickly or what items to buy, but being able to devote full attention to both characters at once makes the game much more manageable at higher levels of play. Aside from missing a true multiplayer component (no, the âlocal co-opâ doesnât count), TWEWY is a game perfectly crafted for the handheld mindset.The missions here never take too long and youâre always able to save on a whim.You can do as much or as little combat as youâd like since the encounters are by choice rather than at random.The game even gives an incentive for you to return by continuing to level up your pins while itâs shut off.Just like the fashion mecca itâs centered around, this game also never sleeps. TWEWY was a total blast from confusing start to convoluted finish.Believe me, after the credits roll youâll be just as bewildered as I was as to what on Earth just happened.But fear not, once completed youâll be rewarded with a plethora of bonus content â including the ability to replay any day you wish to unlock extra swag and plot info.If you own a DS, put it to good use and check this title out! You have seven days.